By using the option JT Forms you can offer personalized print products to your users. With the update to version 5.6 you can now simplify the personalization by offering form fields pre-filled with user data. How is that possible? Quite simply, you can make use of the new variables which come with the update to version 5.6. These new variables also include the variables used for the adress fields of the user accounts which you can use to pre-fill data fields. Create a printable PDF as template for your business card. Create text fields for each value (e.g. name, email) using the form function of Adobe Acrobat Professional. Edit the field properties and choose an appropriate variable as default value. The online help of Printgroove JT Web provides an overview over all available variables. Create a new JT Forms product and upload the newly created template. 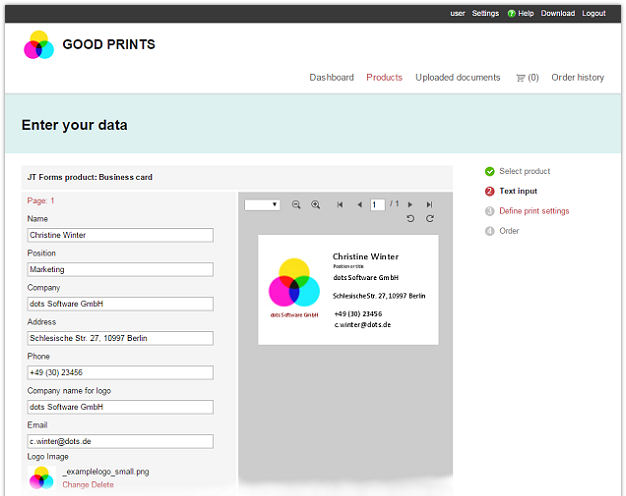 Now, when the user selects the business card in the online shop, the form fields are automatically pre-filled with the user's account data.